Have you ever heard the phrase “the middle-age spread?” In women, this term is used to refer to the extra weight gained as menopause starts. The extra weight works its way onto our bodies and accumulates around our midsections rather than on our thighs and hips or evenly distributed, regardless of how you used to carry your weight. Not only does the weight sit differently on your frame, but it also seems to be harder to lose. In fact, you may not change a single thing about your diet or exercise habits and suddenly find yourself gaining weight once you reach your peri-menopause and menopause years. The cause of this weight gain is not one simple issue. It is, instead, a combination of factors coming together to create a sort of “perfect storm” for weight gain. Firstly, we must consider the hormonal changes associated with menopause and the way that changes our physiology. As we move into this stage in life, our bodies begin to shift priority from muscle to fat. In doing so, our calorie burn slows down. So an activity that used to burn 300 calories may now only consume half as much. Secondly, menopause tends to encourage us to eat a little bit more. For some of us, emotional eating becomes a real problem. As our hormones fluctuate, our emotions fluctuate and it can be easy to seek comfort in a favorite food. They’re called “comfort foods” for a reason. Finally, menopausal women often face a decrease in physical activity. Menopause may come with some uncomfortable signs such as hot flashes, racing heartbeat, and fatigue. The recommended response to these is to rest. This rest can lead to a sometimes dramatic drop in activity level. So our bodies just aren’t burning the calories that they used to, we may be increasing the calories that we take in, and our physical activity level can be dropping, sometimes drastically. When you take all three factors into consideration, it’s no wonder menopausal women tend to gain weight. 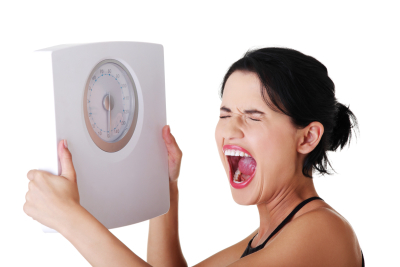 Now that we have a knowledge of what is causing the weight gain, what can we do about it? The answer is as multi-faceted as the problem itself. We can eat fewer overall calories. This doesn’t have to be a huge complicated change. Decreasing calories can happen with a few little changes. For example, when you’re craving something sweet, eat fruit as opposed to chocolate, cake or other junk food. Choose leaner cuts of whatever meat you’re eating. If you’re eating chicken, choose the breast as opposed to the thigh. If you’re eating steak, choose something lean as opposed to a heavily marbled cut. Drink water as opposed to soda, squeeze in a little bit of fruit if you want flavor. We can increase our exercise. Find something you love like walking, dancing, bike riding or even jumping on a trampoline! We can decrease the amount of dietary fat that we consume, and this will help almost as much as anything else we can do. Again, simple choices can be what make the difference here. Skip the ice cream and munch on frozen fruit for dessert. Eat your baked potato without cheese on top. Skip the creamy salad dressing and opt for a squeeze of lemon or lime. Remember this: It is critical that before you start any diet or exercise program, that you get the go-ahead from your doctor. Working with a physician can help to ensure that your program and progress are safe, effective and sustainable.